The Florida SMaSH Beer Festival was created to celebrate to creativity and camaraderie of the brewers in the Sunshine State and provide an opportunity to give back to the community. Each brewery will concoct a beer all made from the same single malt and single hop. This limitation forces brewers to think outside the box as well as focus on outstanding technique. With roughly 80 beers to sample including one-offs from every brewery involved, there will be something to please everyone. With proceeds going to the Sharing Center, this is the perfect chance to enjoying some delicious craft beer while supporting a great cause. 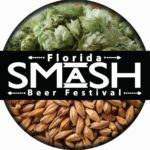 Visit FloridaSMaSHBeerFestival.com for more information.